Calling all Mad Men fans and sandwich lovers, you won’t want to miss this Brooklyn Avenue Sandwich! 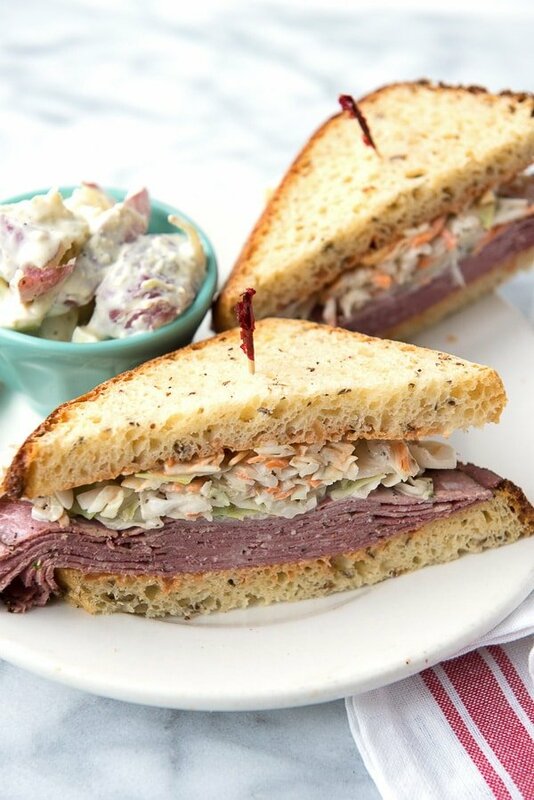 Pastrami on rye bread with cole slaw on the sandwich and Russian Dressing. Lunchtime really doesn’t get much better than this. About 3 or 4 years ago when my son was still in elementary school, I was working on a project with a few teachers. After meeting one-on-one with the only male teacher in our school, a young, hip, highly coveted teacher by the students, he asked me if I watched Mad Men. I didn’t. He said I really reminded him of one of the characters in the show. Not watching it I did not think to ask which one. Fast forward to today. I’ve just spent the last two weeks immersed in the 1960’s, binge watching all 7 seasons of Mad Men. I tend to watch series, usually online, and love well-developed characters, sophisticated plots and scenarios that so draw you in that you feel as if you’ve traveled to the location or era. A few friends strongly encouraged that Mad Men had to be my next watch, and I’m so glad they did. Candidly it took a little while to engage with the show for me. For those who have not watched, it is an AMC series about an ad agency in New York City spanning the entire decade of the 1960’s. There is a quorum of key characters, Don Draper being the main focus (played by Jon Hamm), and the audience rides side car as they navigate the trends and perils of the time usually smoking and drinking a lot. Watching from 2015 many things struck me in addition to the complexity of the characters. They would generally roll into work not so early, ask their ‘girl’ for coffee as she hangs up their coats and then drink straight booze from the stylish bar carts in their office at any happening, good or bad, all through the day. Don Draper frequently ‘lays down’, having all his calls held, as he naps during the day before unfurling a genius ad slogan which really is his sole worth. It took me about half of the first season to not feel I was going to hurl just watching all the smoking, everywhere from restaurants to meeting rooms and airplanes. I was initially captivated by the characters and their roller coaster plot lines. The secretary who becomes a copywriter, really facing what I’m sure women did in a man’s work force in that era. A voluptuous red head office manager becoming a partner and savvy business woman battling for men to take her seriously in the board room rather than wanting to spend time in the bedroom. The men’s indiscretions in their personal lives and work, coming within an inch of their lives of being caught. But usually like a cat, living out more than nine lives before things crashed down on them. The housewives dedicated to a clean house, impeccable make up and dress, the entire priority of their day being a dazzling dinner on the table when their ad men husbands arrive home (which is usually much later than they promise; and of course there were no cell phones to communicate in a timely way). My attention broadened to notice the series impeccable attention to detail. Every article of clothing, furniture, turn of phrase in perfect place. I almost had a heart attack when in one episode near Halloween, there was a ‘vintage’ decoration of a black cat on an orange accordion stand in Joan’s office that I purchased myself from eBay a few years ago. I love the fashion. Have searched eBay for some particular bar glasses they use in the latter season and spied many items I recall from my Grandmother’s kitchen. I also loved the discovery of big brands we know today in their nubile form just starting out needing a catchy ad campaign. Somewhere in the midst of season 6 when Pete Campbell is working in Southern California with his distinct tan and receding hairline, he takes visiting Don Draper to a deli where they have a Brooklyn Avenue sandwich. Pete is raving about how it’s like New York on the west coast (though the bagels are terrible per his opinion) with pastrami on rye with cole slaw directly on the sandwich. Insert the sound of cartoon brakes screeching to a halt now. I paused the show right then, wrote down the name of the sandwich, began to text all my friends from the New York area and spent two hours researching. I had thought the sandwich was originally from New York and served at this Los Angeles deli but that was not correct. The sandwich was conceived at Canter’s Deli in Los Angeles, a Jewish-style deli opened in 1931 originally on what was Brooklyn Avenue (and is now Cesar Chavez Ave) in Boyle Heights. The only thing about the sandwich I could find online was from their menu. 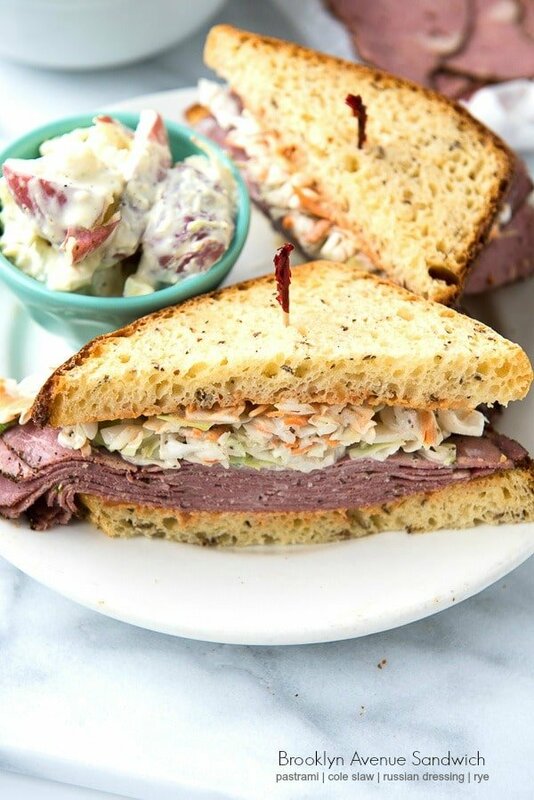 Pastrami, cole slaw and Russian Dressing on rye with a side of potato salad. Turns out the Mad Men Episode was filmed at Canter’s and not one thing in the restaurant had to be changed to be 1960’s authentic; it is still exactly the same as it was in the ‘60s. Though I’m not a big sandwich gal, this sandwich had my name all over it. Pastrami is not a common lunch meat any more and I was immediately hungry for it. It took me several calls locally before I could find traditional beef pastrami (thank you Whole Foods) rather than turkey or bison pastrami. 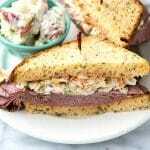 The crunchy sweetness of cole slaw ON the sandwich? Where do I sign up? And Russian Dressing. I spent another hour researching the roots of Russian Dressing to develop a recipe that was in keeping with the era. There are fine lines and practices about Russian, Thousand Island and Catalina dressings I learned, with many opinions on each. It originated in New Hampshire actually but originally often had caviar as an ingredient hence the name. 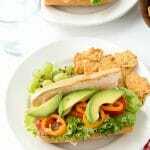 It is not a chunky dressing (though there are recipes making an exception) but rather a slightly spicy sandwich spread with mayonnaise, tomato ketchup or chile sauce, horseradish and other spices. Though it takes a bit of time to whip up fresh cole slaw and the Russian Dressing (which should be made before hand to chill for a few hours and thicken), it is completely worth it. I even augmented one of our favorite gluten-free bread mixes to create a ‘safe’ version of rye bread. The flavors of this sandwich are fantastic; sweet, salty, spicy. 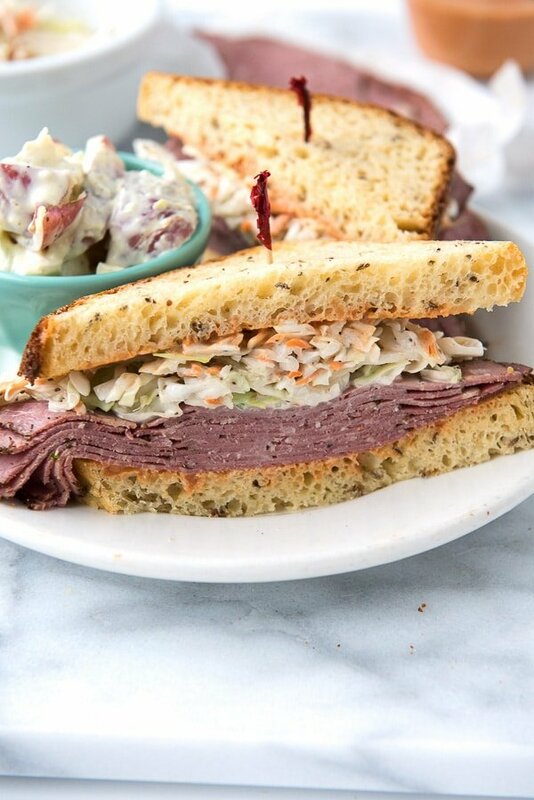 The texture and mouth-feel is out of this world between the thin pastrami and the crunch of the cole slaw. My family gobbled it up and quickly went out to buy more pastrami! Served with a side of traditional potato salad and you are set. Check out the Mad Men series and definitely the sandwich! I never have figured out which character the teacher felt I reminded him of. But I’m glad his comment piqued my interest to watch. For this sandwich alone! Inspired by an episode of Mad Men featuring this sandwich from Canter’s Deli in Los Angeles, the Brooklyn Avenue may become your favorite sandwich ever! 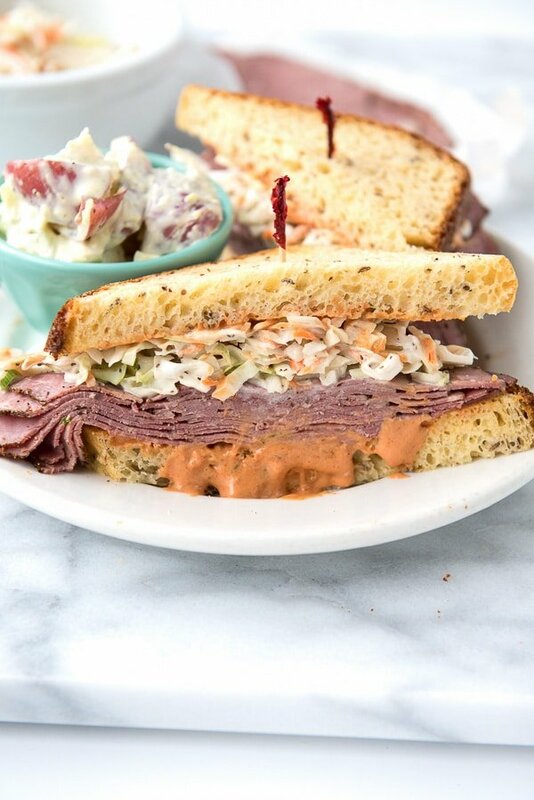 Spicy Russian dressing slathered on rye bread, with pastrami topped with cole slaw! What’s not to love? 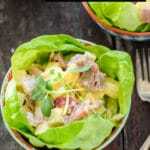 Included is a recipe for ample Russian dressing and cole slaw. Planning for 4 ounces pastrami (or to your preference) per sandwich, there will be ample ingredients to make several sandwiches. Each the Russian dressing and cole slaw recipes may be made independently for different uses and increased by keeping the proportions the same. I personally amended our favorite gluten-free breadmaker mix to make a mock rye bread that is gluten-free! Those details are shared in the Notes section below. 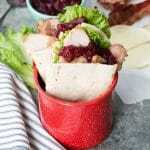 This delicious sandwich has everything; salty, sweet, tangy and crunch! Combine all ingredients in a blender (or in a mixing bowl using an immersion blender); pulse into a smooth mixture. Transfer into a sealable container and refrigerate for at least 2 hours. 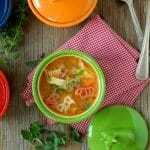 In a large mixing bowl, combine the mayonnaise, apple cider vinegar, sugar, dijon mustard and celery seed; whisk to combine. Add the scallions and cole slaw mix; use a mixing spoon to toss the greens into the sauce until it is fully combined. Refrigerate in a sealed container until use. Spread some Russian dressing on two slices of rye bread. Add 4 ounces pastrami, top with a helping of cole slaw. Sandwiches may be held together with toothpicks if desired. Serve with a side of traditional potato salad. A shortcut gluten-free mock rye bread made by augmenting a mix. I made the bread in a breadmaker but it also could be baked normally following the instructions of the mix. Ingredients: 1 box Glutino 'Gluten-Free Favorite Sandwich Bread' (and the called for ingredients for the mix: eggs, oil/butter) ¾ teaspoon Apple Cider Vinegar, ¾ teaspoon dried Orange Peel, 2 tablespoons Light Brown Sugar, 2 tablespoons Caraway Seeds, ½ teaspoon Onion Powder, ½ teaspoon dried Dill Weed Follow package instructions adding vinegar to the wet ingredient and dry ingredients on top of the flour before the yeast (if making in a breadmaker). I know I’m late to the party, but what kind of chile sauce? It looks fantastic! I can’t wait to make it. Any brand is fine. I think I used Heinz Chili Sauce which you’d find in the condiment area of the store with the ketchup. I didn’t want to shortchange the sandwich history Pete! I love this sandwich too. I think we need to head to the original deli in LA and get the real thing! HELP!! 1 teaspoon pimentos in the Russian dressing? Pimentos in the flesh, dried, or what? If it’s actual peppers rather than dried and ground, why only a teaspoon? I’m sorry, but this just doesn’t make any sense to me at all. I loved Mad Men and didn’t know that the sandwich was actually created in Los Angeles! Thanks for sharing such a delicious sandwich and a brilliant recap of the series! So glad you liked it. Before making something potentially with regional or ethnic roots I always research. I respect tradition and don’t want to rub anyone the wrong way making their prized recipe wrong. It was fun to learn all I did in the process of making this sandwich! It is quite obvious that none of these folks ever lived in Brooklyn and never had a real Pastrami sandwich on Rye. Was that Rye bread in the pictures? Doesn’t look anything like the rye bread of my youth. The pastrami shown in the illustration is some kind of smoked meat but not the cut used for pastrami in a real Brooklyn (Kosher) deli. 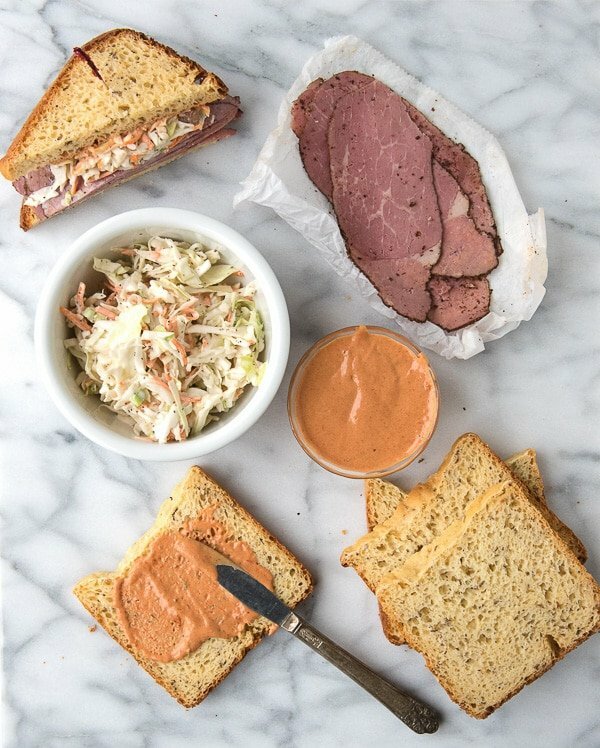 Cole Slaw and Russian dressing was reserved for Corned beef sandwiches. The Russian was a more modern addition to the deli fare where deli mustard was the traditional condiment for both Corned beef and Pastrami. Alas, all is moot! 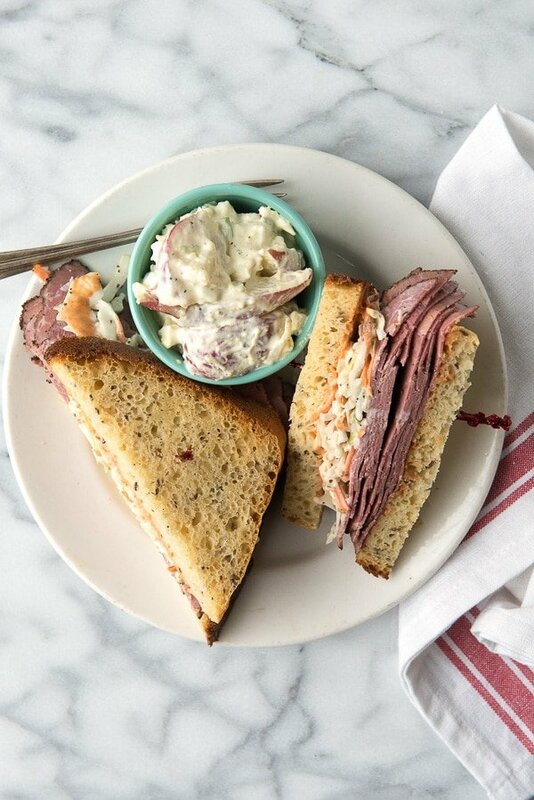 It is almost impossible to get a real good Corned Beef or Pastrami Sandwich today, let alone a real slice of Rye Bread. Hi Neil. You are indeed correct, this is not pastrami as used in traditional Brooklyn deli’s. As noted in the blog post, this sandwich was originated in California in Canter’s Jewish-style Deli in the 1930’s which was on Brooklyn Avenue (now Cesar Chavez Avenue), hence the name. It was not intended as a replica of sandwiches from New York, but rather its own creation. You are also correct the rye bread is not traditional to what you would know. I am gluten-free, as are all the recipes on this blog, and unfortunately traditional rye bread has gluten. I made a gluten-free rye bread (which is delicious, especially for those of us who so sadly miss traditional rye bread) to accompany this fantastic sandwich. Of course those who can eat gluten, would be able to eat it with a traditional rye bread! I’ve been hooked on ‘Mad Men’ since the first episode. I worked in Manhattan during the last of that era — not for an ad agency but for a long-defunct magazine. Glad you discovered it too. What I did not realize was the term Mad Men was actually used for the ad executives on Madison Avenue; coined by themselves apparently. I really sunk into it feeling I was living in the 1960’s. It was eye opening in many ways and I appreciated their attention to detail on every level. Well. I just finished my third one of these sandwiches this week, and think I have enough of everything but the cole slaw for another. Can’t believe I hadn’t heard of this combination before, but am so glad you remedied that…thanks, Toni! It was a find for me too Nancy! Don’t you love it? It’s definitely our new favorite. This has my name all over it Toni! It looks so fantastic! Oooh this looks so wonderful Toni! I’ve never watched MadMen but could get into this fabulous sandwich! I’ve never seen MadMen but that sure wouldn’t stop me from enjoying this sandwich, it looks fabulous Toni! A binge watch of MadMen is on my list of things to do. 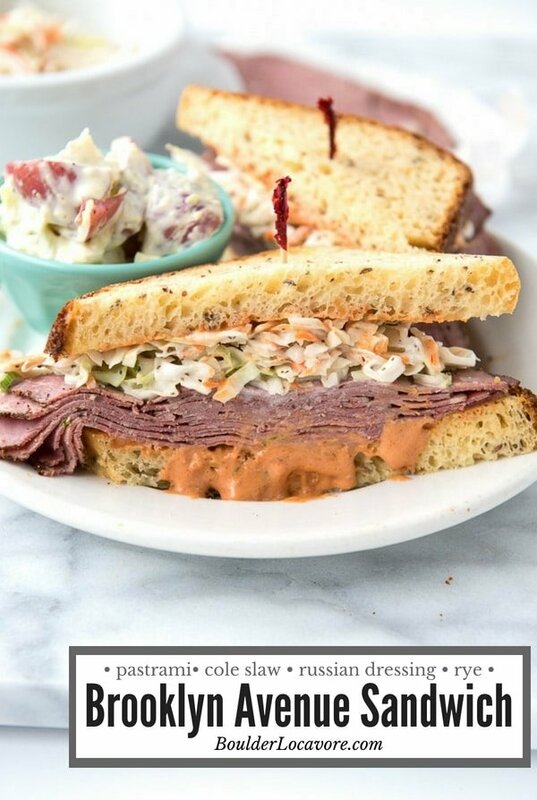 But until then … I can sure enjoy these sandwich, since I love pastrami and the slaw and dressing sounds like it will be perfect with it! This brings back so many memories…we used to get sandwiches just like this from the Goldlake Deli in Larchmont NY, where I grew up, every Sunday night. Love this post! My list of things to make from your posts just keep growing…this may have to move to the very top, however! We haven’t watched the show, but have heard about their attention to detail. This sandwich has to be one of the best benefits from watching! Thanks for the research, and the recipe! Thank you Nancy! I will say this sandwich has skyrocketed to the top of our family lunch list without question. Everyone loves it. Hope you will too! And you would hope a young male teacher would not think of me in that way! If I recall I was wearing something vintage at the time. I too have no idea who it would be.